NEW for season 2016-2017: renovated hotel rooms and completely new transformed SPA CENTER. Location: The modern MPM Hotel GUINNESS is situated in a serene and quiet area only 200 m. from the Gondola lift. 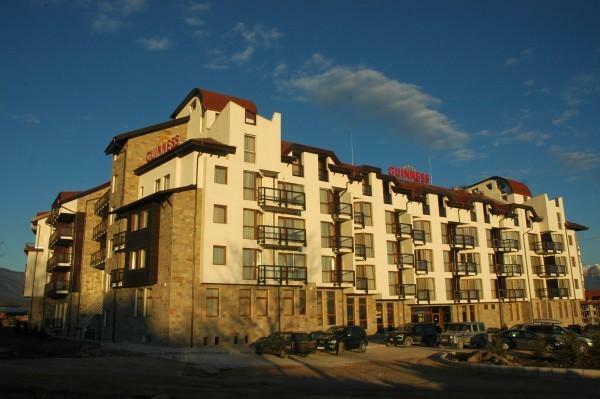 Apartments:Comprises of 120 spacious and stylishly decorated studios and apartments with magnificent views of the surrounding mountain and ski runs. Studio: Approximate size: 35 m2. A large premise with a king-size bed or 2 single beds and an extendable arm-chair or sofa suitable for 1 adult or 1 child. The Studio is equipped with a mini bar, TV and telephone and the bathroom with a shower cabin and hair dryer. One bedroom apartment: Approximate size: 50 m2. Consists of a bedroom with king-size bed and a living room with extendable sofa suitable for 2 adults or 2 children. The Apartment is equipped with a dining table, a mini bar, TV and telephone and the bathroom with a shower cabin and hair dryer. Two bedroom apartment: Approximate size: 75 m2. Consists of 2 bedrooms with king-size bed and a living room with extendable sofa suitable for 2 adults or 2 children. The Apartment is equipped with a dining table, a mini bar, TV and telephone, bathroom with a shower cabin and hair dryer and a second bathroom for guests. Bars & Restaurants: The main restaurant has a capacity of 200 seats offering European and Bulgarian national cuisine. With a unique fireplace reaching the hotel roof top and atrium architecture, the lobby offers warm and cool drinks, snacks, pizza and pasta. SPA Center. The spa areas features heated swimming pool, sauna, steam bath, massage and a large number of treatments. Page rendered in 0.1513 seconds using 1.64 MB (4 MB) of memory.